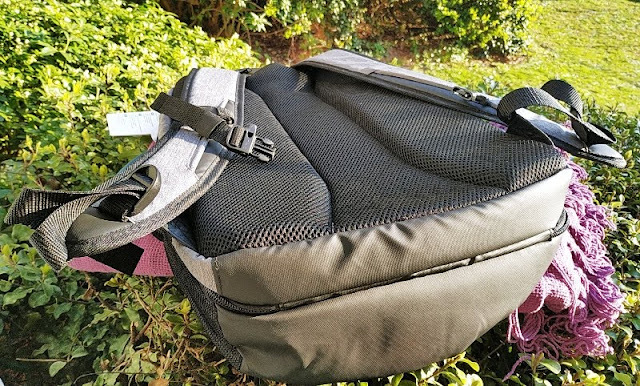 Many people who don't have the use of a car to get to work find themselves carrying a few bags a everyday to store their work laptop, gym stuff and lunch. 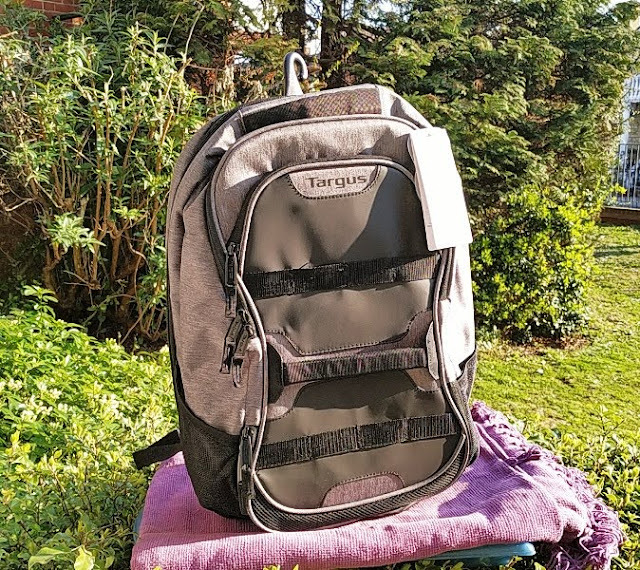 If you commute everyday to work and are tired of lugging around 2-3 bags you can permanently cut down the number of bags you carry on you with the Targus Work + Play 27-litre backpack. 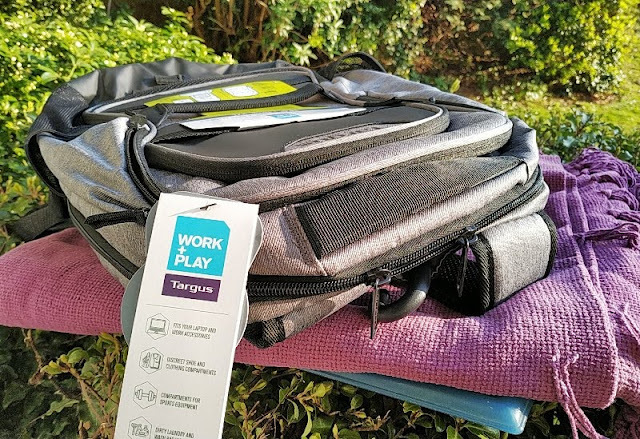 The Targus Work + Play is a gym work bag combo that can also store a laptop with screen size up to 15.6 inches so you can easily use the Targus Work + Play backpack as a carry-on bag for flights. 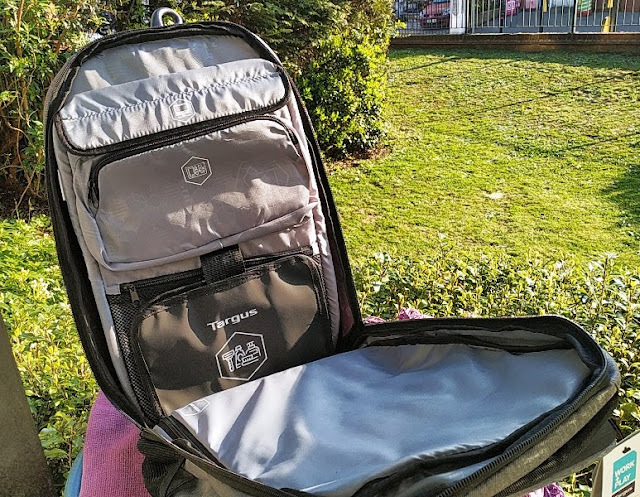 What makes a bag like the Targus Work + Play perfect for work, gym and travel is having dedicated compartments for shoes, toiletries and dirty clothes, as well as a very handy hook for hanging the backpack on a rail. 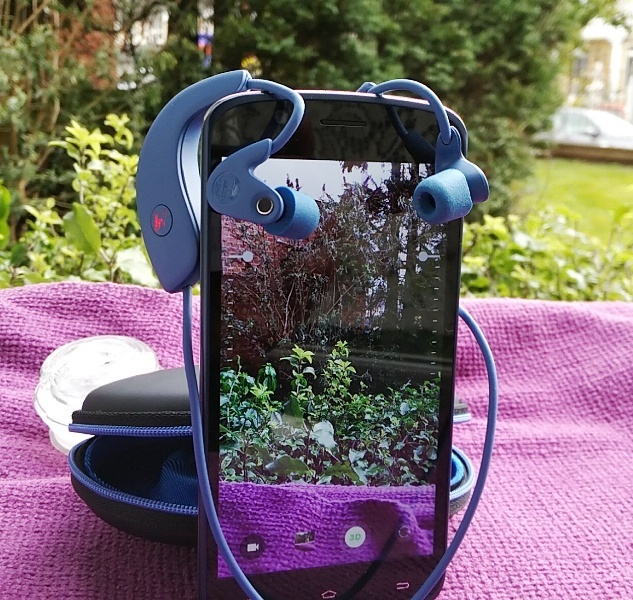 The hook can be concealed too by tucking it inside, which is nice. 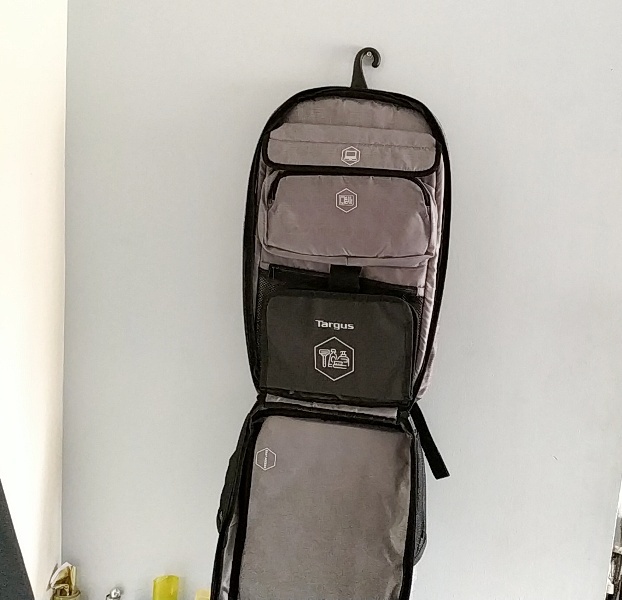 The Targus Work + Play backpack effectively doubles as a detachable hanging toiletry travel bag without looking like a travel bag. 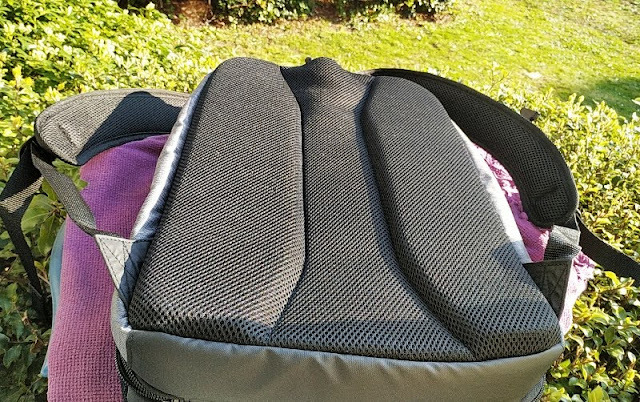 The backpack is stylish enough for commuting and will blend quite nicely in a work environment. 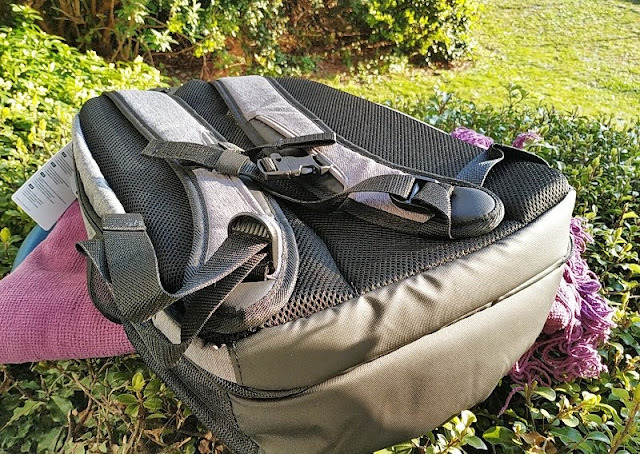 There are three ways in total you can carry the bag thanks to a padded top handle grip and a side handle grip that lets you carry the bag horizontally like you would with a duffel bag. 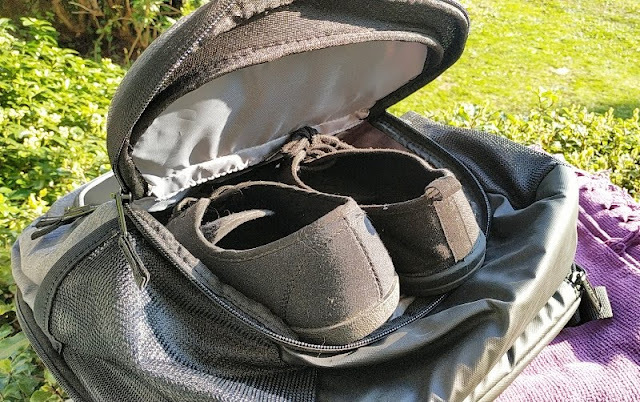 The Targus Work + Play backpack shoe compartment is designed to fit big shoes (up to 12-size) though 9 size shoes and smaller is the realistic shoe size you can fit in the shoe compartment if you plan on storing a 15.6 inch laptop and clothes. 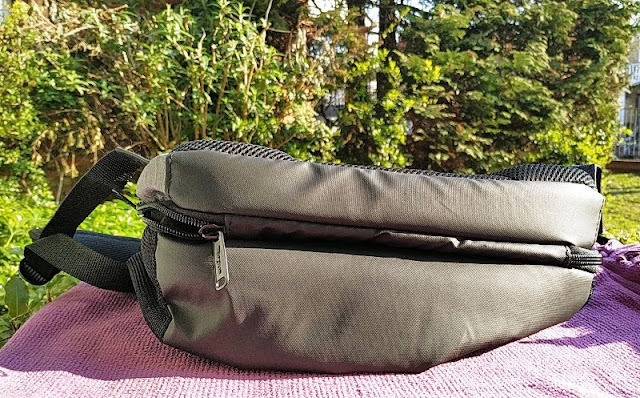 There is a good number of compartments to organize a laptop, clothes and while there aren't dedicated compartments for small everyday items like chargers and cables you can always use the dedicated toiletry black pouch to store smaller items. 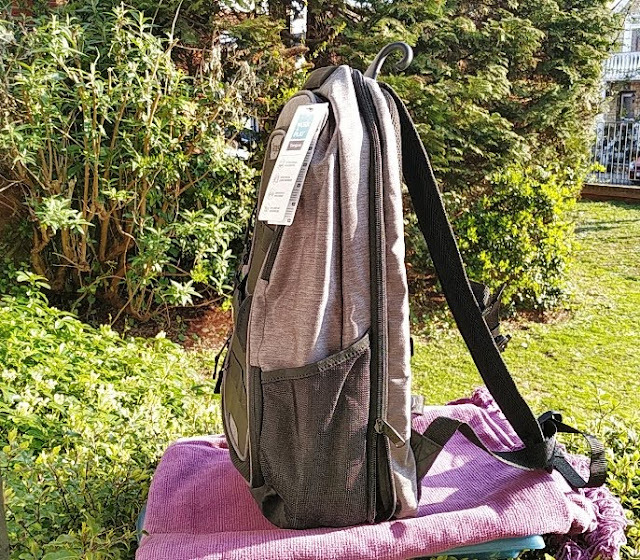 A large drawstring pouch for dirty clothes is also included with the Targus backpack which can be used for laundry or for keeping fresh clothes. 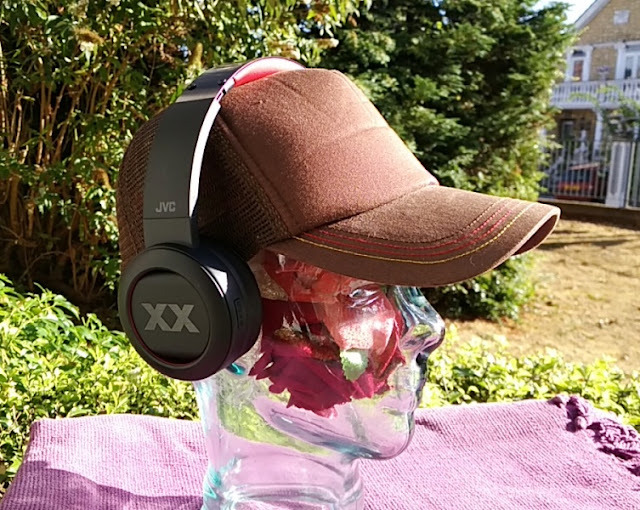 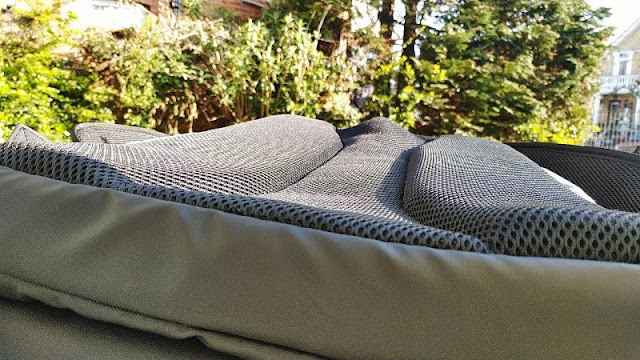 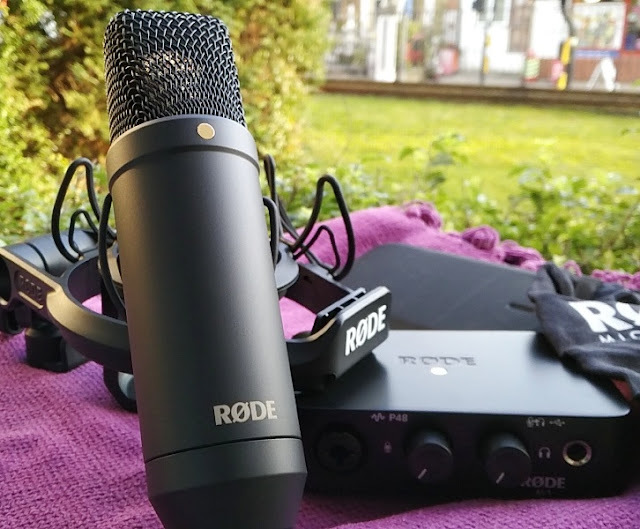 The exterior material is made from 100% polyester which is in itself a water resistant fabric but there isn't any Durable water repellent (DWR) coating applied to the polyester. 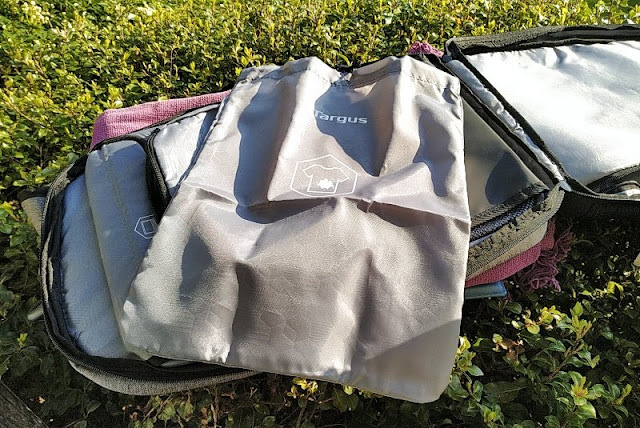 Without DWR coating, the backpack is not 100% waterproof; hence the Targus Work + Play laptop backpack won't be able to survive torrential rainfall without the backpack getting soaked and drenched. 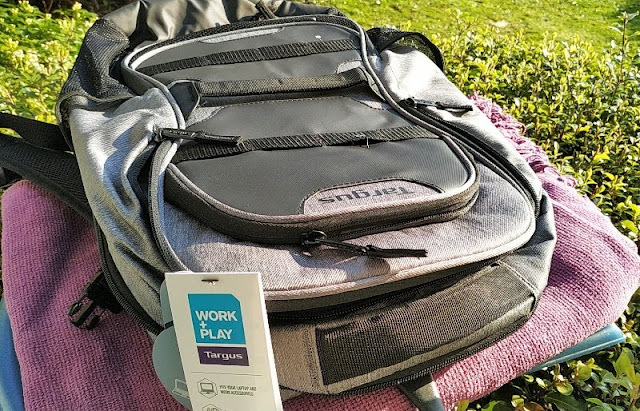 The Targus Work + Play backpack opens up 180 degrees and features smooth operating zippers that glide through, allowing you to zip and unzip the backpack with one hand. 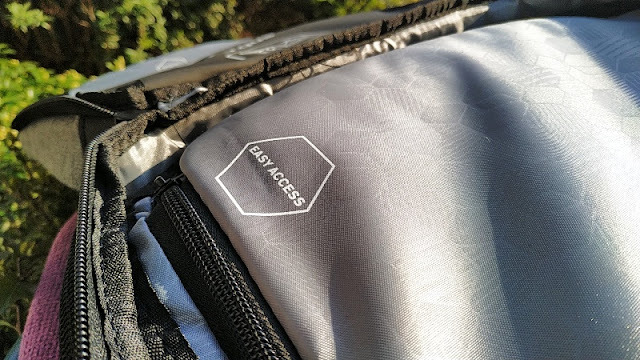 Internally, the Targus Work + Play backpack features 100% polyester lining and a couple of zipper compartments, namely a small zipper compartment and a large zipper compartment, labeled "easy access" which is built along the front of the backpack. 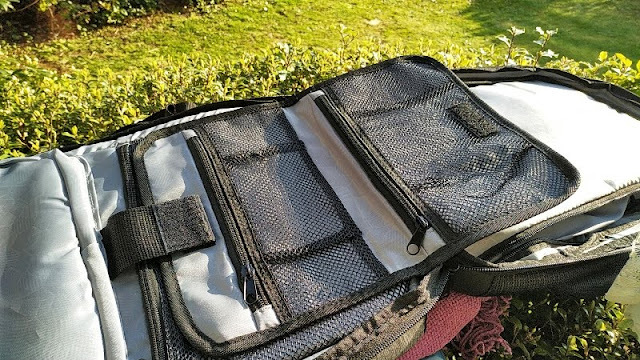 The laptop compartment has soft lining, thick cushioning and a flap with two velcro fastening to prevent the laptop from slipping out. 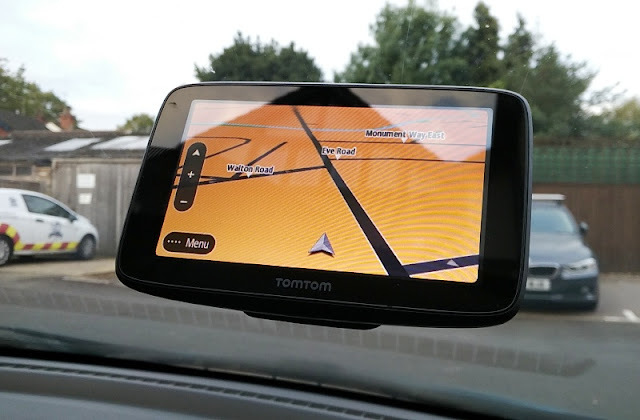 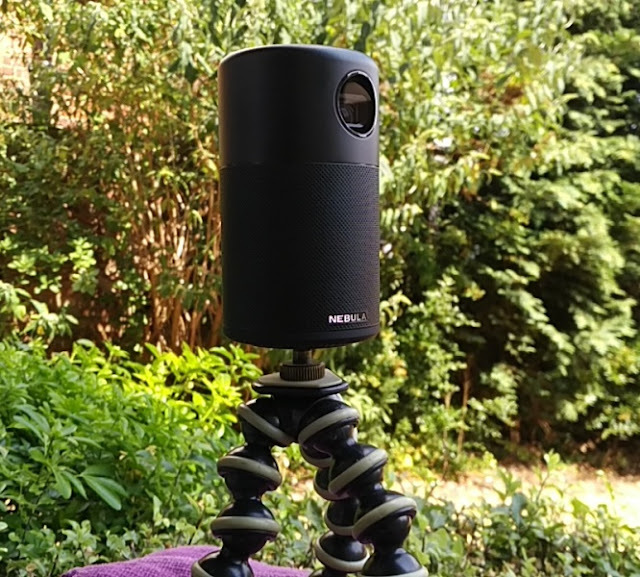 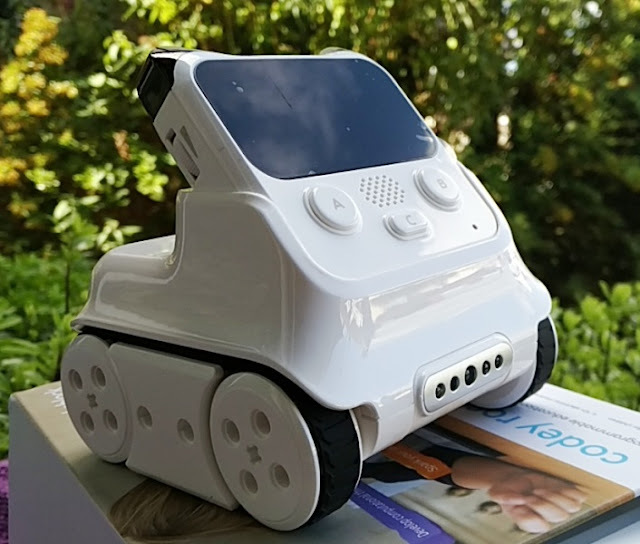 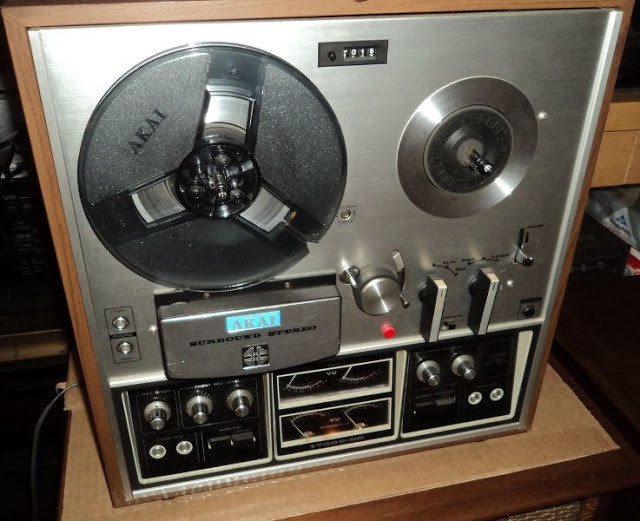 The dimensions are 38.7cm high, 2.5cm deep and 26.5cm wide. 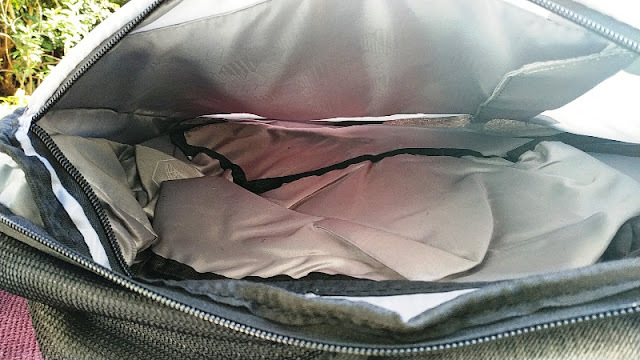 The "easy access" compartment is very roomy when there isn't any shoes stored in the shoe compartment. 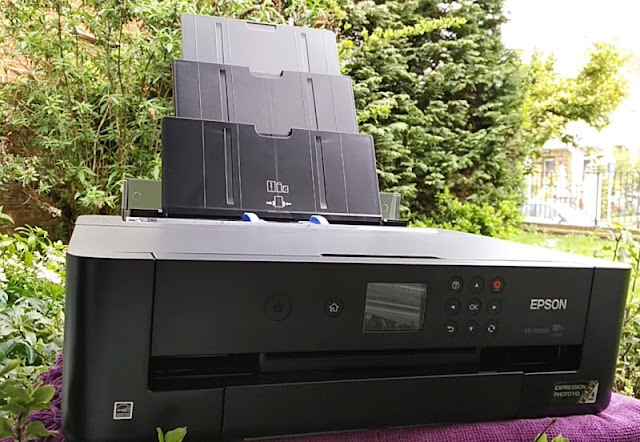 But, as mentioned earlier, cramming 12-size shoes will take a lot of space (about 80% of the easy access compartment). 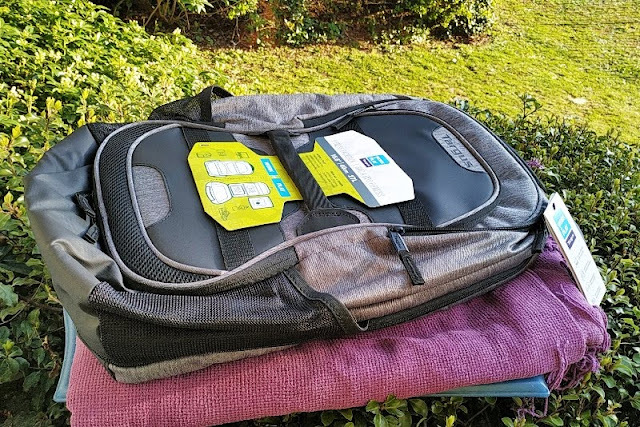 Comfort in a backpack is always very important so it's nice to see that some good thought has gone into the comfort of the Targus Work + Play particularly since it's a backpack that can store up to 27 liters. 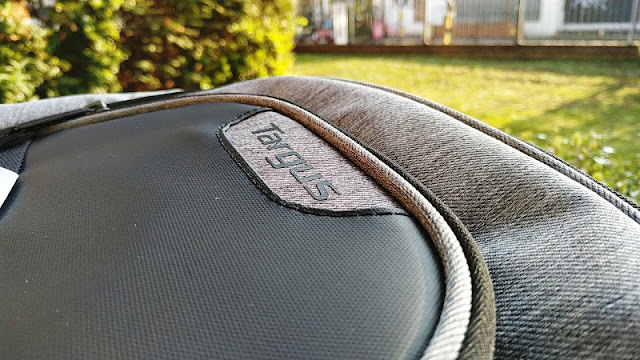 The backside of the Targus Work + Play is covered with breathable mesh covering thick foam padding separated in two sections for ventilation to prevent a sweaty backside. 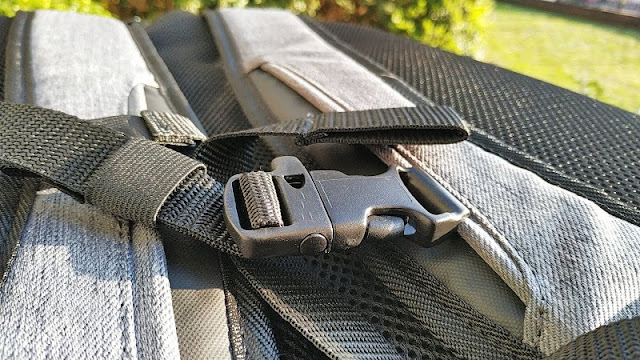 The backpack straps have fairly thin foam padding but have a curved design which prevents the straps from slipping off your shoulders. 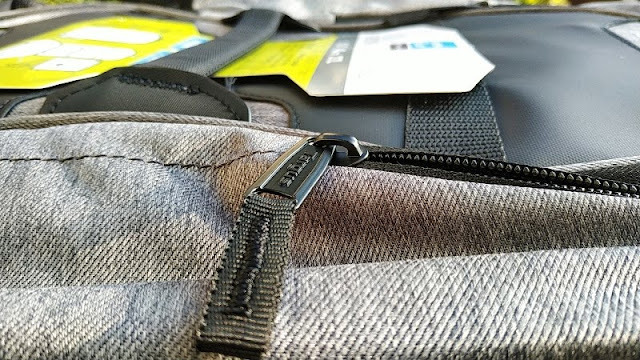 Covering the backpack straps is the same polyester material on the front and breathable mesh fabric on the back. 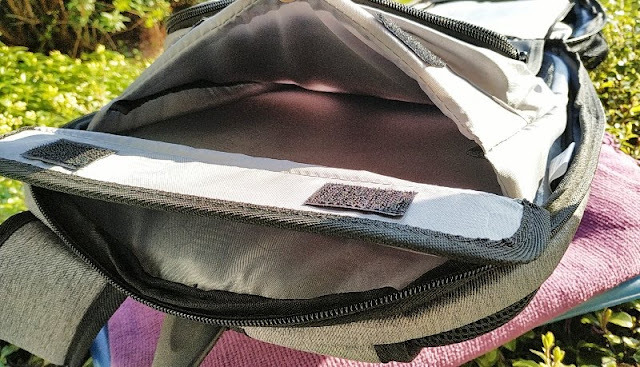 On the sides of the Targus Work + Play backpack you find elastic mesh pockets for water bottles, socks and other bits and bobs. 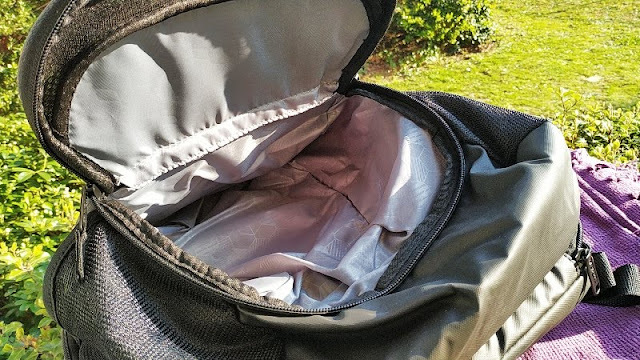 The bottom of the Targus Work + Play backpack has a special covering made with faux leather (aka PU leather or artificial leather) which is waterproof so it will prevent any water ingress seeping through the bottom of the backpack. 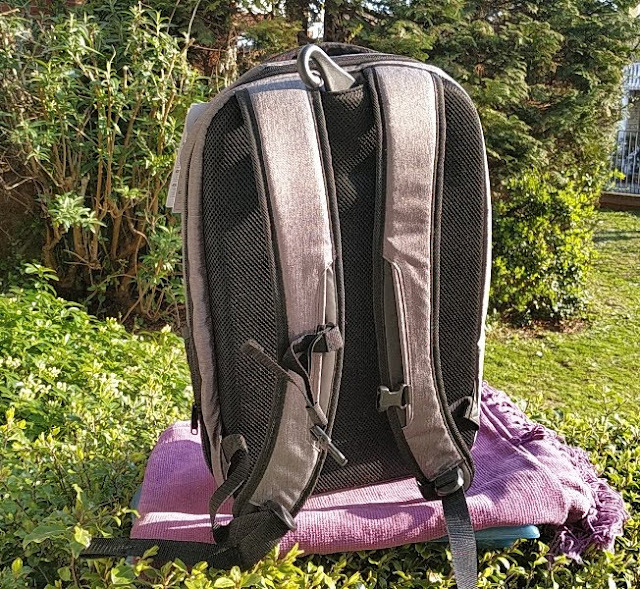 The length/height of the Targus Work and Play backpack is 49cm long, 31cm wide and 23.5cm deep which is how far the backpack can expand. 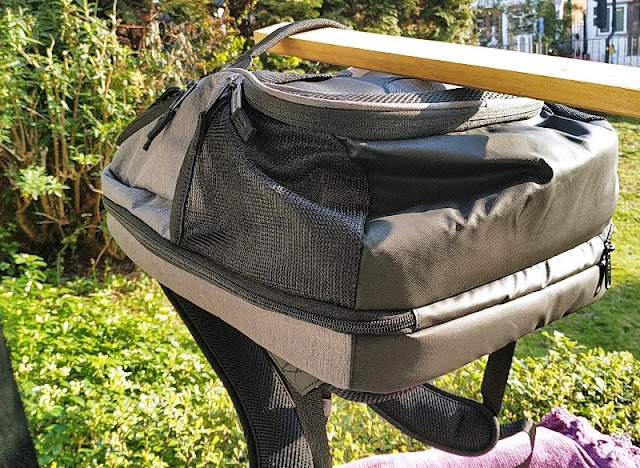 The weight of the Targus backpack when empty is just 1 kilogram. 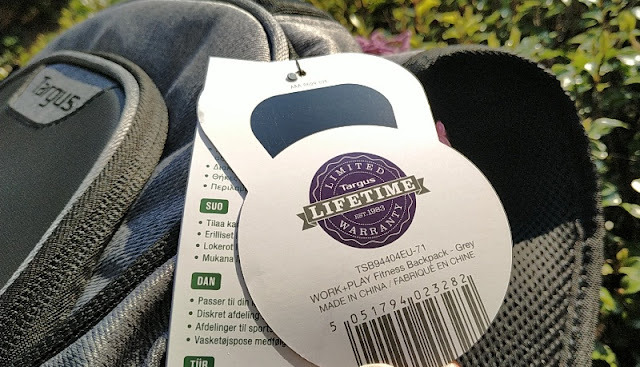 The backpack comes with a limited lifetime warranty for as long as you own the Targus Work + Play backpack.